I am not sure about you, but I am having a hard time fathoming the scope of the damage from Harvey to the greater Houston area. Texans will be recovering from this once-in-a-lifetime storm for years, if not decades. We have all seen the horrible news footage of the damage to homes, businesses, and infrastructure. We see the suffering of people and animals alike and are compelled to do something. I know I was—and I donated $200, which seemed very insignificant to me. But a Georgia travel agent was thinking out of the box a little bit (as we are prone to do) and offered to help. 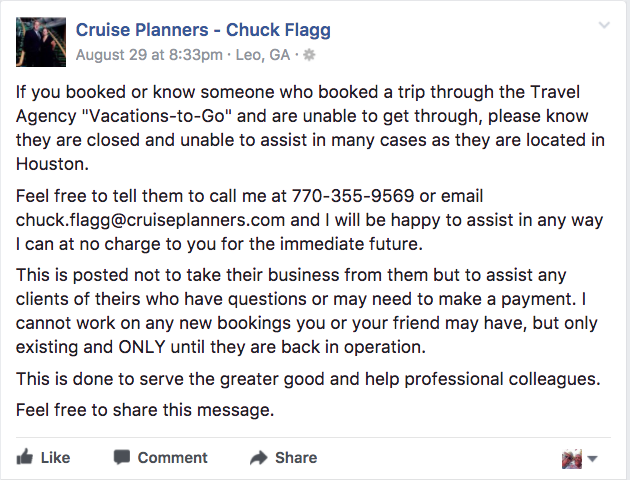 Chuck Flagg, a writer for TRO and Georgia-based agent, began to wonder what about the travel agents affected by Harvey? And their clients? And he reached out! Like my donation, this too was a small gesture, but one that was (I am sure) much appreciated by clients and the agency owner. When your city is under water, I imagine that sweating the details of a client’s upcoming trip are the furthest thing from your mind. Chuck Flagg stepped to the plate and yet again proved why this industry is so incredible. People helping people. Will he make money off of this? No! Will he gain extra clients? Possibly, but probably not! Will he earn the respect of the 50,000 people reading this? You bet! Why not leave him a remark on his Facebook page? Now not all agents are set up to handle overflow. (Aside: this would be a great time to create an emergency contingency plan if you do not have one.) But that does not mean you cannot help. Donations of goods are pouring in and according to the Red Cross the greatest need right now is money. Storing and distributing clothing and food is problematic at this stage and the money will go to providing for those who have the most urgent needs. I personally encourage you to donate as you are able. That $5 donation is just as relevant and helpful as the $36 million Michael Dell has given. But be careful. With any catastrophe, there will be scammers. 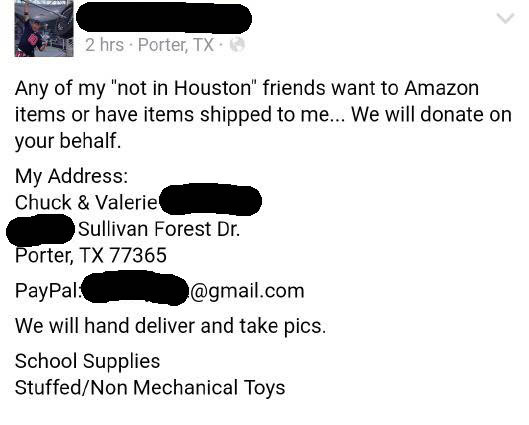 Locally a woman was posting a link to a Facebook post of a “friend of a friend” asking for people to ship him goods via Amazon (or money—he included his PayPal account) and he would hand deliver it to people in need and post pictures. Uhm. No thanks! Below is a vetted list of reliable vehicles for donations. Please help.